A Chameleon can change his colors but can a Gekko? Last Week I Reviewed “The Town” which has probably revitalized Ben Affleck’s Career. This week I was really interested in seeing Wall Street Money Never Dies. I don’t remember seeing the first Wall Street, directed by Oliver Stone 23 years ago, so I brought my father along with me who really liked the first movie. The question I had in my mind was could Oliver Stone bring the passion into Wall Street Two as he had with the original. The first piece of this puzzle was of course Gordon Gekko (Michael Douglas) who is reprising his role that won him an Oscar 23 years ago. We pick up in the Wall Street Story in 2001 when Gekko is being released from Prison. No one is there to pick him up on his release date, and we learn all he has left is his daughter Winnie (Carey Mulligan). 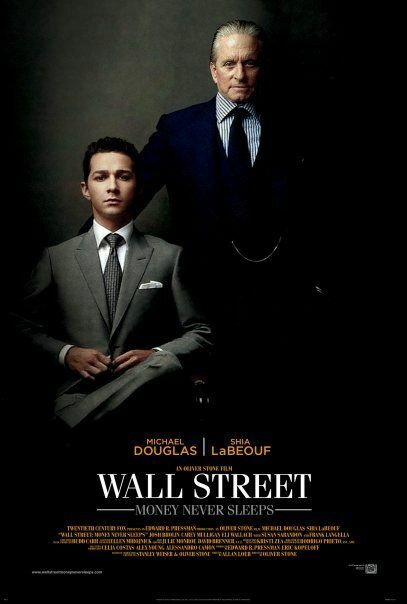 Winnie has fallen in love with Jake(Shia LaBeouf) who is a young Wall Street Trader just like her Father whom she hates. Jake’s character is a very complex young man. He is a young Wall Street trader, a believer in the system, but a believer with a twist: as with all Stone movies there is political messages everywhere in the movie (I Don’t Mind It, but some people do) Jake has a side project which is putting money into green energy, a sure sign that we are to take him as a good guy. A tragedy involving his mentor (Frank Langella in a small but impactful role) leads Jake on a different path, one that involves revenge as well as teaming up with Gekko, now out of prison for 8 years, hawking a book on how the stock market will crash from over extended greedy Americans all over television. So Greed might not be Good. Jake wants revenge on Bretton James(Josh Brolin), a somewhat successor to Gekko. Bretton takes the game farther, along with those of his company and even the U.S. Government, he helps bring down the U.S. economy. Yes, this story is based on our current economic problems, but at the same time it is entertaining. Douglas does a great job as Gekko, we love and hate him all over again. The conflict between him and his Daughter is played off great by Mulligan. I do think Stone could have used Mulligans talent even more. Not just have her play a wounded daughter who has been hurt by her father, but use her talents more than every time we see her she cries about something. Stone does get the best out of Brolin who always plays a great guy you love to hate. The movie though really relies on Douglas, and I think as I stated with Affleck last week, this is the best movie I have seen Douglas in a long time. (I have not seen “Solitary Man” and have heard he is great in that as well). LaBeouf is great in the flick as well, kind of like young Charlie Sheen from the first Wall Street. The only problem I had with the film is that they had enough plot to fit into another film but pushed everything together, and jumped around a lot. I also did not like how the movie ends. Does Jake get his revenge on Bretton James, Does Gordon Gekko change his ways from the original 23 year old movie, this is something you will have to go see for yourself. Buckeye Brad gives this movie a B if you need something to invest a little bit of money into this weekend, you will enjoy what you get back in return. My Father stated to me the first Wall Street was better than this new version, but he enjoyed it and said that Gekko was Back.